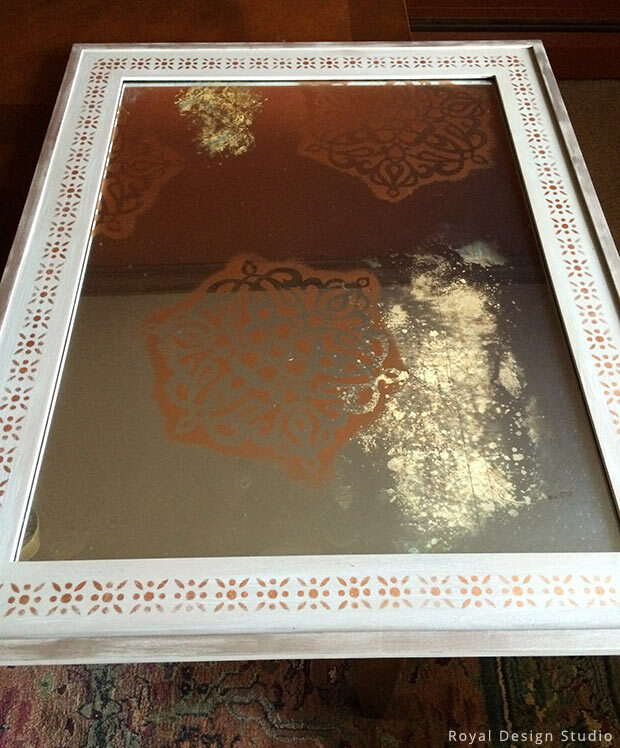 You can turn any picture frame into an antiqued mirror that looks like it was discovered in a dusty corner of the back of a shop in Istanbul’s Grand Bazaar. This project is easier and faster than it appears. In fact, you could complete it in the time shorter than it would take you to go to the airport, clear the TSA lines and board a flight to Istanbul! 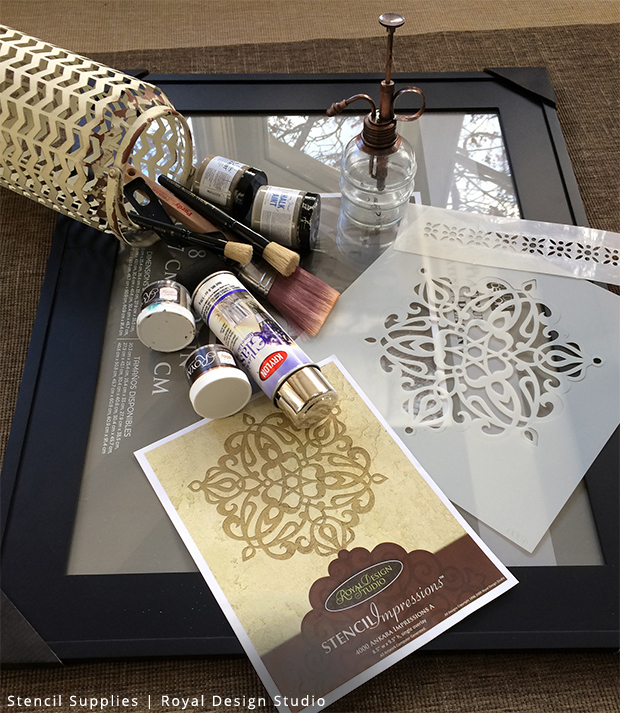 As a first step, plan where to paint your stencil on the glass (I used a Turkish Ankara medallion). Place painters tape in these spots as a guide. You can add another layer of pattern by putting patterned scrapbook paper behind the mirror, to peek through a faded area of mirror. If you want to do this, map out where to put the scrapbook paper and place painters tape in this spot too. The blue rectangle above shows where I planned to put scrapbook paper. I wound up adding a second spot of scrapbook paper towards the end of the project in the opposite upper corner, because I thought one patch of scrapbook paper looked unbalanced. You can get larger frames from Michaels, JoAnn or Hobby Lobby for a good deal during a 40% off sale or with a coupon. 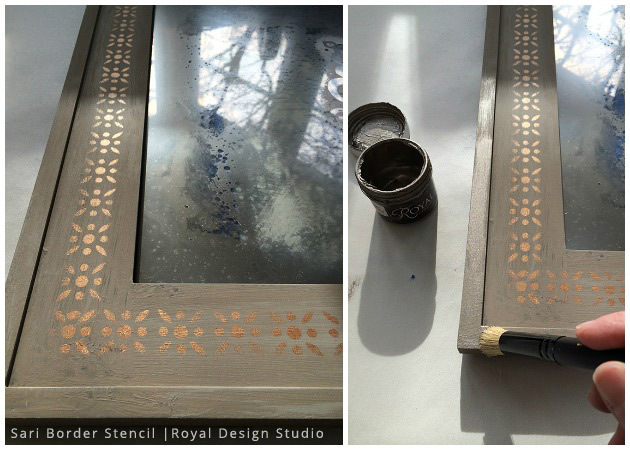 If you want to stencil the frame too, look for a frame with a wider flat surface so there’s room for a stencil. 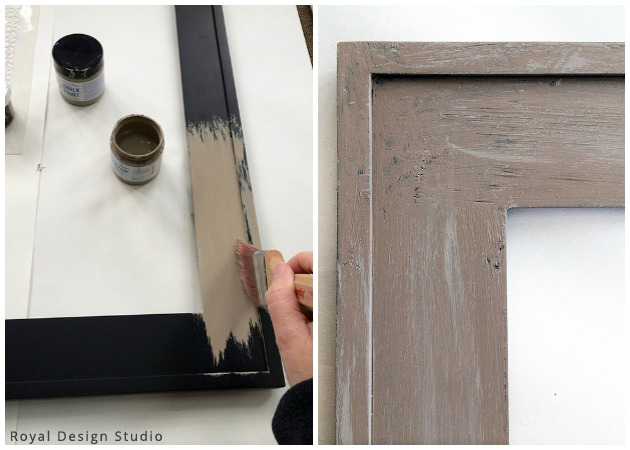 Paint the frame with Chalk Paint. I used two coats of Coco, let it dry, and then dry brush accents with a lighter Chalk Paint color. I painted with French Linen Chalk Paint® unevenly, a bit heavier in some areas and lighter in others. In some spots, the frame’s original dark color shows through and that’s okay, it gives the old imperfect look I wanted. Then, as an optional next step, paint a stencil on the frame if you like. I trimmed off an edge of the border stencil to lay it flat against the raised edge of the frame and to easily align the border in the center of the frame. The border was painted with Copper Kettle Stencil Creme, the same color I plan to use for the Ankara Medallions. This will help tie the mirror and frame together. Of course you could always do more color contrast, if you want. Finally, I painted a light coat of Smoked Oyster Stencil Creme along the raised edge of the frame to give this area a dressy metallic sheen. Now let’s turn the plain glass into an antiqued mirror! It’s really cool to see this transformation happen. Flip the glass over so you’re working on the backside of the glass. Clean it with glass cleaner and dry it well. Place your stencil between the painters tape guides. Remember the tape should now be on the side opposite to the one you’re painting on. 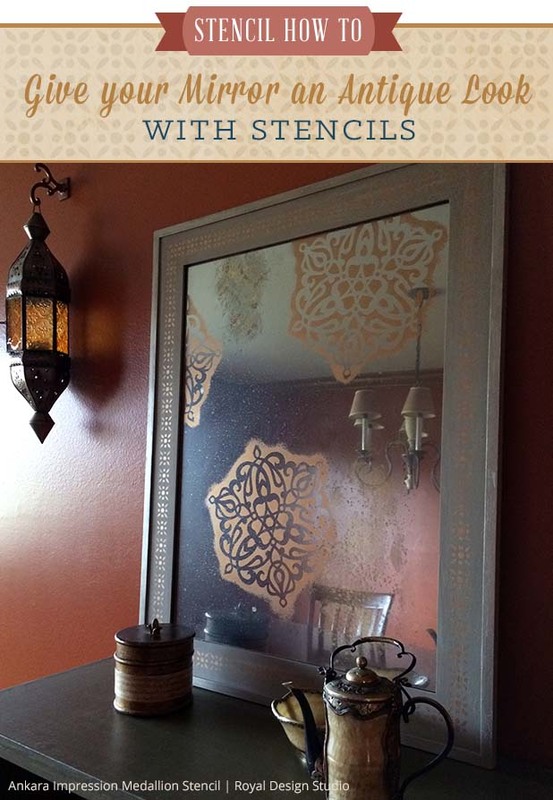 Paint your stencil onto the glass. 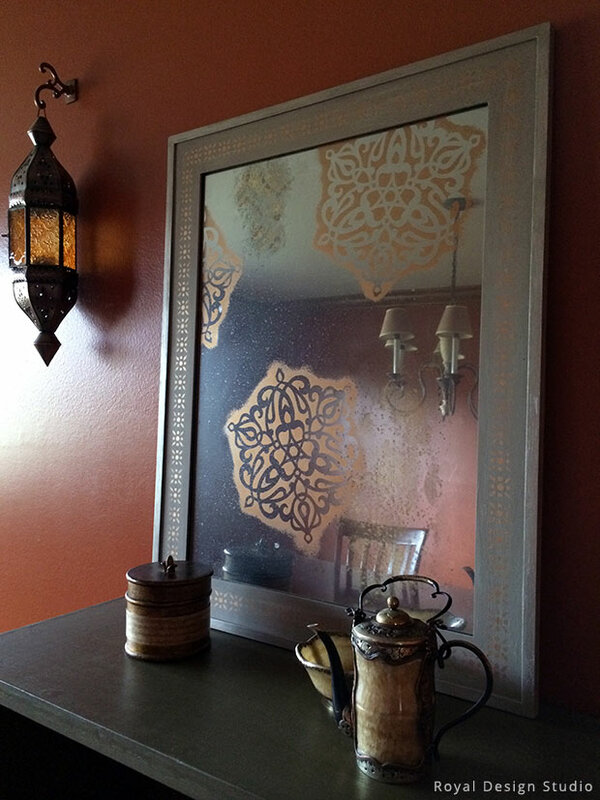 I chose to paint three Ankara Medallions with two motifs running off the edge of the mirror. I also overlapped one Medallion over the rectangle where I intend to put scrapbook paper to layer the patterns a bit. 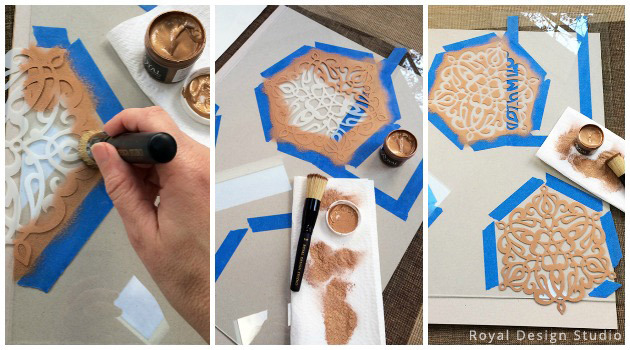 I painted the Ankara Medallions with Copper Kettle Stencil Creme. Let the painted stencil patterns dry. Next, you will “paint a mirror” with the Krylon Looking Glass spray paint. This paint is really stinky!! Definitely use this paint outdoors, or in a room closed off from the rest of your home, and where you can open windows for ventilation. My Chaai the Crafty Cat was hanging out with me as he usually does during DIYs, but when the Looking Glass spraying started, he high-tailed it back into the house! I was working in our three-season sunroom and opened a bunch of windows. First sprinkle water drops onto your glass. I had a little plant mister and used that, because doesn’t it also look cute in the photos? The water drops you spray will add the antiquing effect. 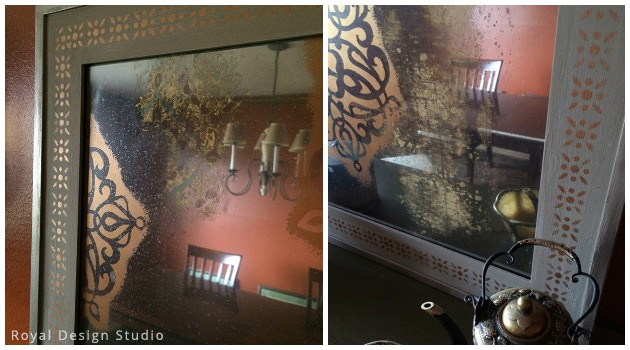 Sprinkle water droplets all over the glass, even on top of the painted stencils. Then, start spraying the Krylon Looking Glass paint before the water drops dry up. Spray several light layers. At first you will still be able to see through the glass and that’s okay. You want to build up several light layers, not one big heavy layer. 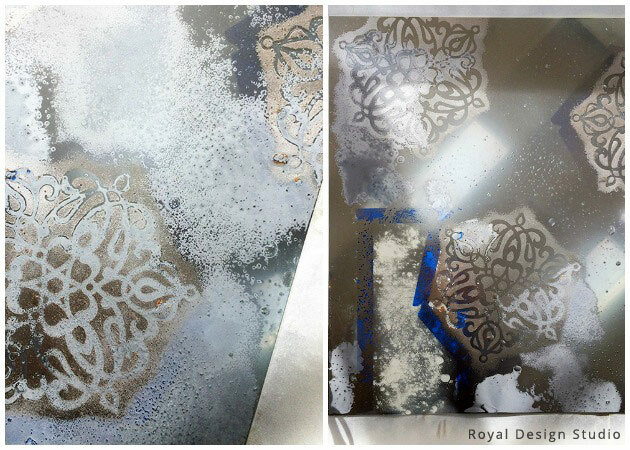 As you continue to spray light layers, you will see the silver reflective mirror emerge on your glass. And also, you will see the blue painters tape disappear. When you can’t see the tape anymore, this is a good gauge that you’ve sprayed enough mirror paint on the glass. However, if you want scrapbook paper to peek through faded areas of glass, be sure to remember to spray less paint in those areas. That’s why I taped painter’s tape as a guide. As long as I could still see that rectangle of tape, I knew there would be a faded area for the paper to show through. If there are some areas where you wanted to spray lighter, you can dab some spray paint off with a paper towel. Just be sure to dab the paint off while it’s still wet or damp. It will dry fast. Your project might look like a terrible mess at this point. But don’t worry, as long as you’re spraying several light and even layers of the Looking Glass paint, it should work out okay. The “right” side of the glass will look better than the “wrong” side or back side. I took a peek to see how the mirror looked. Yay! Antique mirror! You can see the water sprayer reflected here. It’s working! Once the mirror spray paint has dried, you can flip the glass over. You should be able to see through the mirror a bit where you put your taped guide for the scrapbook paper. I pulled out a bunch of scrapbook papers – some with bold patterns, some more subtle. Some with lots of color contrast, some with not much contrast. It’s hard to tell what will look good until you test it! So lift up the glass and slide papers under it to see what they look like. Once you find a look that makes you happy, tape your chosen scrapbook paper onto the backing that goes behind the glass. And if you ever want to change the color and pattern of the scrapbook paper for a different look, you can easily open the frame and switch the paper. 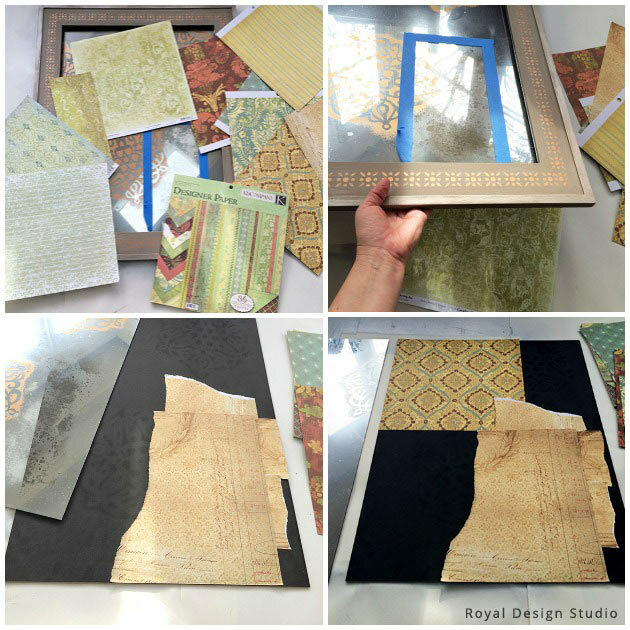 Once your scrapbook paper is taped onto the backing, you can secure the backing into the back of the frame. You’re all done! Here’s my finished mirror along with the inspiration that gave me the idea to tuck scrapbook paper behind the “faded” mirror – an industrial shabby chic mirror I saw at ABC Carpet & Home in New York City that costs a lot more than my DIY mirror cost. Here’s the new “antiqued” Turkish mirror in our dining room, with a little metal and alabaster teapot and bowl found at the Night Market in Luang Prabang, Laos. It makes an exotic combination! 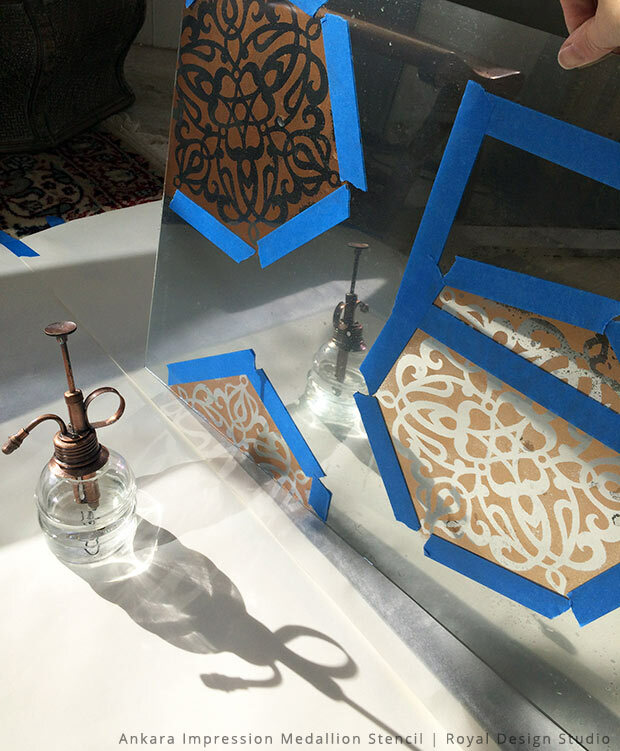 As another way to decorate glass with paint and stencils, check out a DIY of a Moroccan medallion that I painted on the underside of a glass table top. Substantial-report actors spine Jordan metallic element vapour nine CR recently published,this is actually interval cristiano ronaldo’s certain running shoes, Jordan horseshoe used continue year’s NBA TEAM just about all-headliner finest template look, but severalof the visual bearing prior to when little shiny manner,but also them problem is basically pulled in numerous running footwear fan’s attention. Your boot willfrom November 7, detailed also in the international front. This website truly has all the information and facts I needed aboutthis subject and didn’t know who to ask.